Sir Richard Burton's Tomb - St Mary Magdelen's Churchyard, Mortlake. It is easy to miss the churchyard of the Church of St Mary Magdalen, which would be a great pity as it really is a lovely place and it contains a genuine London curiosity. 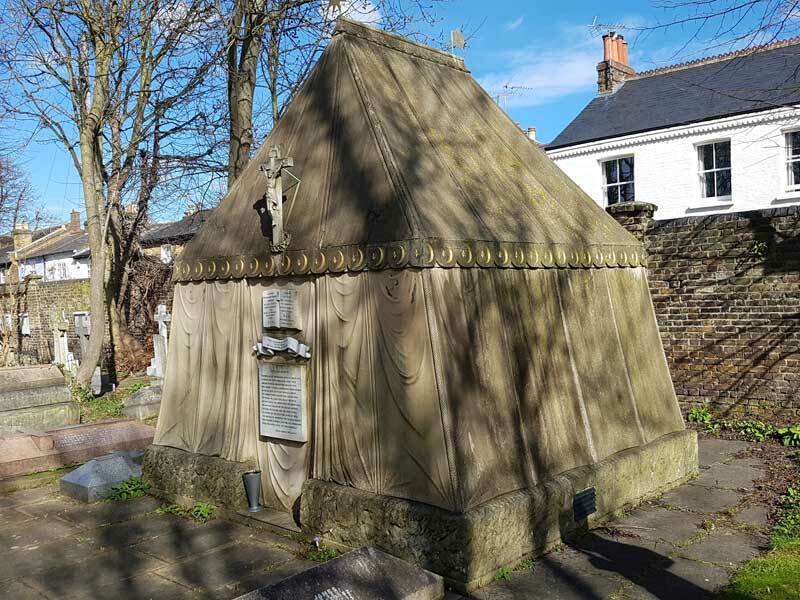 For, having slipped through the gate that leads to the churchyard, and having gone clockwise around it, you find yourself blinking in disbelief at the tomb of Victorian explorer and linguist, Sir Richard Burton (1821- 1890). It is a truly amazing sight, one that transcends curios and enters the realm of the truly eccentric! Sir Richard Burton (and be careful not to make the usual mistake of confusing him with the actor of the same name), you see, is buried in a stone replica of a Bedouin tent that stands 12 feet square by 18 feet high and is adorned with frieze of Islamic crescents and stars. His tomb is a proud remembrance of his many achievements that included travelling in disguise to Mecca, an unexpurgated English translation of One Thousand and One Nights (better known as The Arabian Nights ), bringing the Kama Sutra to publication in English, and, together with John Hanning Speke, acquiring the distinction of being the first Europeans to visit the Great Lakes of Africa in search of the source of the Nile. Startling as this incongruous monument is, yet another surprise awaits you here. If you make your way to the rear of the tomb and climb an iron ladder that has been conveniently placed against the rear wall of the tomb, you can even peer through the glass plate at the tomb's interior. 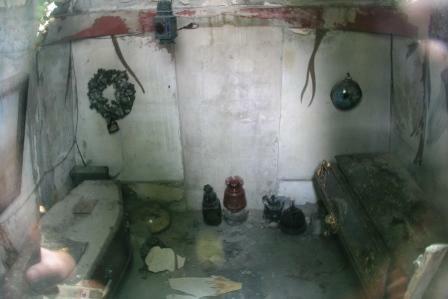 As your eyes adjust to the gloom within, you find yourself looking down upon the coffins of Burton and his wife, Isabel Arundell, surrounded by dusty artefacts such as lamps and helmets. It really is a curious and eccentric monument.